Sabaf, the Brescia-based company manufacturing components for domestic gas cooking appliances, listed on the STAR segment of the Milan stock exchange, won the 2018 Oscar di Bilancio financial communication award in the category of Small Listed Companies. 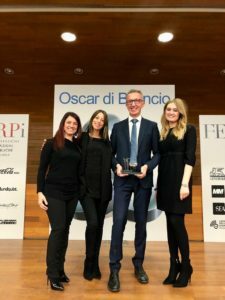 The Oscar di Bilancio financial communication award, promoted by FERPI (the Italian Public Relations Federation), in cooperation with Borsa Italiana, Università Bocconi and the main professional associations, is the contest that every year awards the Italian companies that stand out in financial reporting and in dealing with all stakeholders. The award ceremony took place during an event held in Milan at Bocconi University. Sabaf won the Oscar di Bilancio financial communication award for the fourth time (previously in 2004, 2013 and 2017) and was awarded with the following motivation: “The Sabaf financial statements are integrated and stand out for their ability to effectively and comprehensively represent the economic data of the company’s performance together with a description of the company’s programme and philosophy. The initial dashboard is extremely effective and guides the reading of the document allowing you to understand the information in a concise and straightforward way, thanks to the help of graphs and tables for the aggregation of economic and non-economic data. The presence of tables comparing data over a three-year period is also important: it reinforces the understanding of company’s data and its trend. The decision to direct the graphics of the document towards the concept of ‘growth’ that accompanies the reading of the concept represented in the company data is innovative and original”. “Good financial communication is part of our corporate culture: we are aware that integrated, complete and transparent reporting can help both the investment community – which can understand the link between strategy, governance and business performance – and the company itself, because it helps to create internal cohesion ”, said Gianluca Beschi, Chief Financial Officer of Sabaf, who collected the award. “We work also in this area with a view to continuous improvement: financial reporting is a constantly evolving subject and it is not easy to confirm ourselves as ‘best practice’ at the national level – Pietro Iotti, Chief Executive Officer of Sabaf, commented -. To be awarded again, after the success of last year, is a cause for considerable pride and a strong incentive to do even better in the future. I warmly congratulate all the employees who contributed with passion and commitment to the preparation of our Annual Report”.